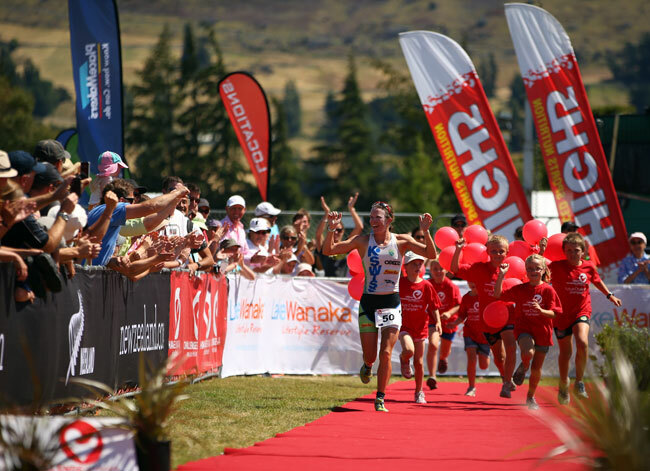 With less than three days to go before Challenge Wanaka 2014, the world’s most scenic long-distance triathlon, both winners from last year say they’re in great shape after introducing new training regimes for this season and are aiming for back-to-back victories. Women’s champion, Gina Crawford and men’s winner, Dylan McNeice have been training in and around Wanaka ahead of the first major race of the year that has attracted several more of the world’s best long distance triathletes. Gina, who now lives in Wanaka full time, joined the team of respected US coach, Matt Dixon late last year after five years of self-coaching. Despite winning eleven long-distance races including every Challenge Wanaka event she’s entered – five from five – she felt that she couldn’t take her career any further alone. “After the World Championships in Hawaii last October I felt more ambitious than ever. It was like an itch I’d never had before. I’ve always seen myself as a business. Triathlon is how I make a living and now I want to take it to the next level,” she said. Dylan temporarily shifted to Wanaka from his native Christchurch to prepare for the race. He said the plan that he and coach, Tim Brazier had put in place was coming together nicely. “At the start of a new season you often doubt yourself, you get sick and then it all starts to come good at this time of year. I love coming home after competing in the US and Europe. Wanaka is such a change of scene it can feel like a holiday sometimes!” he said. Dylan said he feels extra pressure defending his 2013 win but it all comes from himself. “I’ll definitely be taking the race to the others. There’ll be no chance to sit back and enjoy my day. It’s going to be tough and I think we could be looking at a course record. It’s anyone’s race – I wasn’t on the radar last year and ended up winning!” he said. Gina agrees anything can happen on the day and remains focused on her own performance. “I don’t feel any extra pressure as defending champion. I always want to get the best out of myself every time I race. You never know how things will pan out. I’d like to have a good swim to set my day up well and then be more controlled on the bike. I didn’t need to push as hard as I did last year,” she said. After Challenge Wanaka, Dylan plans to defend another of his titles at Challenge Taiwan in April before considering the world’s largest long-distance triathlon, Challenge Roth (Germany) in July. Gina will concentrate on events around New Zealand and Australia with an eye on Challenge Taiwan as well.